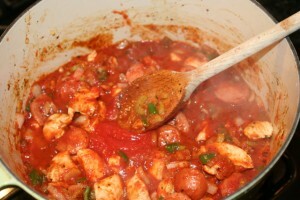 Chicken In Tomato Sauce recipe by Nazia Nazar at DesiRecipes.com. In a pot add chicken , garlic , ginger and salt . Add oil, tomato , green chili and onion . When the water dries and chicken is tender add the black pepper , stir and remove from heat. Yes, Nighat!!! It's 3-4 not 34 tomatoes. It's been corrected. Sorry for the inconvenience. in this recipe Chicken Tomao Sauce 34 Tomatoes or 3-4 Tomatoes plz comform this...thanks. this is copied from desi cookbook. thats not right.